Beautifully designed and crafted to suit your home, any conservatory installation will not just enhance the appearance to your property, it will also give your home a benefit added value. With more than 20 years experience we can transform any living space, and find the ideal way to add a second living room, office or dining area something you have always promised yourself. Victory Windows and Conservatories use Grade ‘A’ Windows only. With Security in mind there is no better available. We offer a range of glazing options in variety of finishes and thickness. Glass can maximise light and noise, but may also be specified stained, leaded, or with Georgian bar inserts. All the glass we use is Pilkington Glass as standard. 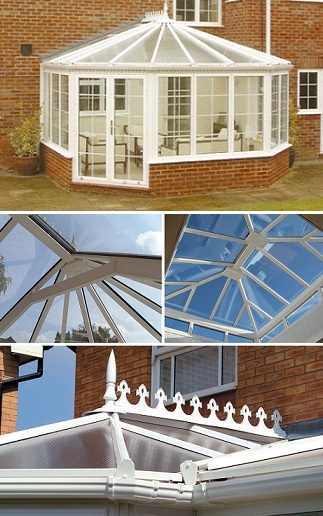 Conservatories can be any lean-to extension room to your current house structure. It could be used as a dining room, a music room or an extension living room. A conservatory has a unique structure than any parts of the room and is made mostly of glass that will permit light to flood in the room space and give it an airy, open feeling. Whether you are simply dreaming of entertaining friends, a family party, or even just having afternoon tea, owning a new conservatory is a luxury you could possibly make come true with Victory Windows (Hampshire). Make a statement with a conservatory that gives an air of affordable luxury that you can enjoy all year around. You might aspire to create more living space, enjoy the benefit of natural light, enhance your home’s appearance, or as an investment in your property.